A new study published by the Institute for the Study of Global Anti-Semitism and Policy (ISGAP) confirms what many have long suspected: that the worst crimes against Jews in Europe are perpetrated by (European) Muslims, and that Muslims have been responsible for a "disproportionate" number of anti-Semitic attacks over the past 15 years. And it isn't just about Israel. Overall, trends in Jew-hate have fluctuated by country since the beginning of this century. 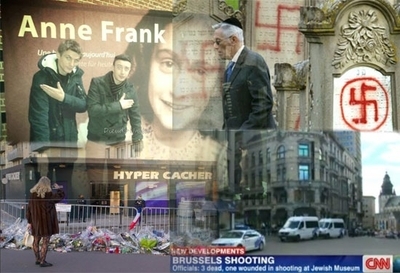 For the most part, reports of anti-Semitism are lower now than they were during the "second intifada" of 2008-2009 despite terrorist attacks on Jews in Brussels, Copenhagen and Paris in the past year alone. But anti-Semitic incidents have risen substantially from 1990s levels; and while, as the ISGAP report notes, "surveys on anti-Semitism that distinguish between Muslims and non-Muslims" have been subject to criticism, "the sum of available studies to date provides strong evidence that the level of anti-Semitism is indeed particularly high among Muslims." The report, authored by Gunther Jikeli, the director of ISGAP France and a research fellow at the Moses Mendelssohn Center for European-Jewish Studies at Potsdam University, examines several surveys conducted since 2006, comparing results country by country. (France and the UK receive particular emphasis.) Most of those surveys were based on subjects' responses to stereotypes about Jews, asking them to agree or disagree with such statements as "the Jews have too much power in politics" and "the Jews have too much power in the media." Country for country, the number of Muslims agreeing with those anti-Semitic statements far surpassed that of non-Muslims. In a 2014 study in France, for instance, 25 percent of the general public agreed with the statement "Jews have too much power in the economy and the financial world," but 50 percent of Front National (right wing nationalist) sympathizers agreed; 67 percent of the Muslim population surveyed agreed. Similar criteria used by Ruud Koopmans in 2008 showed a like trend among 9,000 participants in six European countries, reports Jikeli. Subjects in Sweden, Belgium, Austria, Germany, France and the Netherlands were asked to respond to the statement "Jews cannot be trusted." Consistently, far more self-identifying Muslims agreed with this statement than did self-identifying Christians. In Austria, for instance, 10.7 percent of Christians agreed with this statement; six times as many Muslims agreed—some 64.1 percent; in Belgium, 7.6 percent of Christians agreed while an overwhelming 56.7 percent of Muslim respondents agreed. "In schools where less than 5 percent of the students had Turkish or Moroccan background, 28 percent of the teachers reported that their students made hurtful remarks about Jews or diminished the Holocaust once or a few times during the preceding year. In schools where the student population is over 25 percent Turkish or Moroccan, 43 percent of the teachers gave this answer. Interestingly, when we exclude insults made in the context of the Middle East or soccer, the percentage of insults against Jews is also significantly higher in schools that have many students of Turkish or Moroccan background. According to teacher reports, perpetrators with Moroccan or Turkish backgrounds are overrepresented, forming ten and eight percent of the perpetrators, respectively, while the figure stands at three percent for both student groups in the Netherlands." What makes the ISGAP report especially interesting, however, is the evidence it offers against the commonly-held belief that social class, discrimination, and similar factors play a role in Muslim anti-Semitism in Europe. Rather, notes Jikeli, "the level of anti-Semitism rises with the level of religiosity and with fundamentalist interpretations of Islam." Yet, he notes, "although anti-Semitism is particularly strong among fundamentalist as well as believing and practicing Muslims, the level of anti-Semitism among less religious Muslims is still higher than in the general population." Jikeli also conducted more personal interviews with "117 ordinary Muslim men" in London, Paris and Berlin to learn more about the sources of these ideas for his recent book, European Muslim Antisemitism: Why Young Urban Males Say They Don't Like Jews, published by Indiana University Press. Reading through the report and the consistently vast differentials in surveys between non Muslim and Muslim populations across Europe makes for depressing reading. Yet not wanting to totally give up on changes in Muslim attitudes, one can't help but hope for the one instance, the one country, where things are different, where Muslims – at least European-born, Western-raised Muslims – did not exhibit the highest level of Jew-hate and bigotry, where Muslims led the way in attitudes of tolerance, of peace. "one can't help but hope for the one instance, the one country, where [...] Muslims – at least European-born, Western-raised Muslims – did not exhibit the highest level of Jew-hate and bigotry, where Muslims led the way in attitudes of tolerance, of peace. But it never happens." Statistically, Muslims seem to cling to the idea of their supremacy. Just like we - Jews and non-Jews - believe in ours. Hardly a surprise. Muslim immigrants in Europe have rekindled the anti-Semitism. The native Europeans, for their part, are guilty of tolerating this intolerance in the name of tolerating their Muslim immigrants. Moral cowardice, I think they call it. So, ISGAP just realized that most manifestations of Anti-Semitism in Europe are caused by Moslems. Columbus discovers America! Why doesn't ISGAP explain why this is so? The fact is that the sacred texts of Islam, the Koran and the hadith, are chock full of commands to hate the Jews and make war against them because they are such evil people and cursed by Allah. Even a Moslem who is not longer terribly religious imbibes this anti-Semitism which which he was raised. Islam, itself, is as anti-Semitic as Nazism. Have not Europeans been taught European history, or the progressives thoroughly erased the period of the crusades?